Navigate to The Events Calendar. Click Add an Event using the steps in the guide from Squarespace. This will allow you to create event feeds on pages like the Kids Section for Children's Classes or Member's Events on the Members Pages. 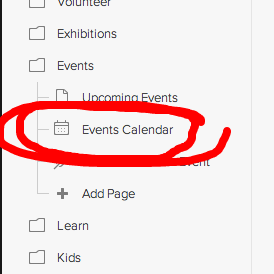 Add a thumbnail image to be displayed with your event in list view. Access the Options tab within the editor window. Click the + button to add a thumbnail image or click and drag an image to add it as the thumbnail image. Use excerpts to display a brief event description for visitors viewing the events page in list view. Within the Options tab, add your excerpt text to the Excerpt field. Talk to Squarespace Support Live! Go to http://help.squarespace.com to live chat or open a ticket with customer Support.